Located in Yosemite National Park. This is a seasonal water fall that flows in winter and early spring. The fall occurs on the east side of El Capitan. There are a few days every February if the conditions are just right with high water flow and an absence of clouds. 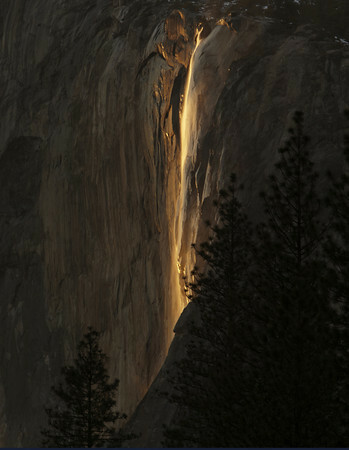 This waterfall is lit up by the last light from the setting sun. The mist will also enhance the color with a bright orange glow. In some years, more dramatic images have been made by increased water flow and some wind, Galen Rowell took an iconic image of this fall back in 1974. The fall is best seen and photographed from a small clearing close to the picnic area on the north road leading out of Yosemite Valley east of El Capitan. If you look close you will see the water flowing at the top and an occasional glow around the mist. I keep going back to witness this special event each year.